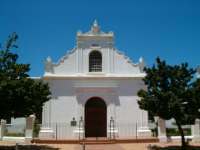 Rhenish Church in central Stellenbosch dates back to it's beginnings in 1823 as a hall to accommodate slaves and the underclass. The church later joined the German Missionary society in 1830. After the emancipation of slavery in 1838, it was necessary to enlarge the church to serve the now larger congregation and an additional wing was added in 1840. The white washed church is another fine example of Stellenbosch's interesting and beautiful architecture.